Feel refreshed as the ocean water splashes around you! 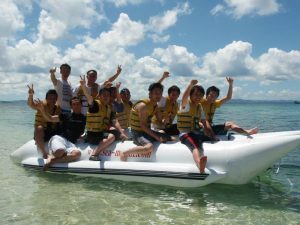 !You can enjoy exciting and high-speed marine sports in the sea of Nishihara!! Feel the speed through straightways and tilting during turns on this thrilling boat ride! The key to a successful ride is teamwork!! Glide exhilaratingly in the sea on a jetski driven by a driver. You can definitely feel the speed by going straight at about 80 kilometers/hour!! An exciting ride where you can experience the power of centrifugal force. You can also get a thrill out of the full impact. *For the fees of each marine sport, please click here. *For all of the above activities, wearing a life jacket is mandatory. *Activities may be canceled due to the ocean condition, etc. on the day. 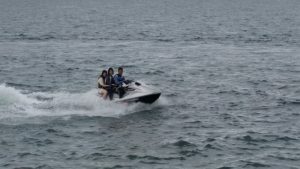 *Both marine sports and jetskis are fully covered by insurance. *A licensed Boat’s Operator operates the jetski.